A Joker on deck in Nolan's floating crap game. See it in 70mm or not at all. When a studio goes to the effort of setting up an IMAX screening for the press, consider me first in line. It’s a luxurious perk and one that generally comes back to reward its backers in the form of a plug. No matter a critic’s opinion of the film, chances are that somewhere in the body of his or her review there will be a mention of the premium format. All bets are off on the rare occasion that the film up for question was shot in 70mm. 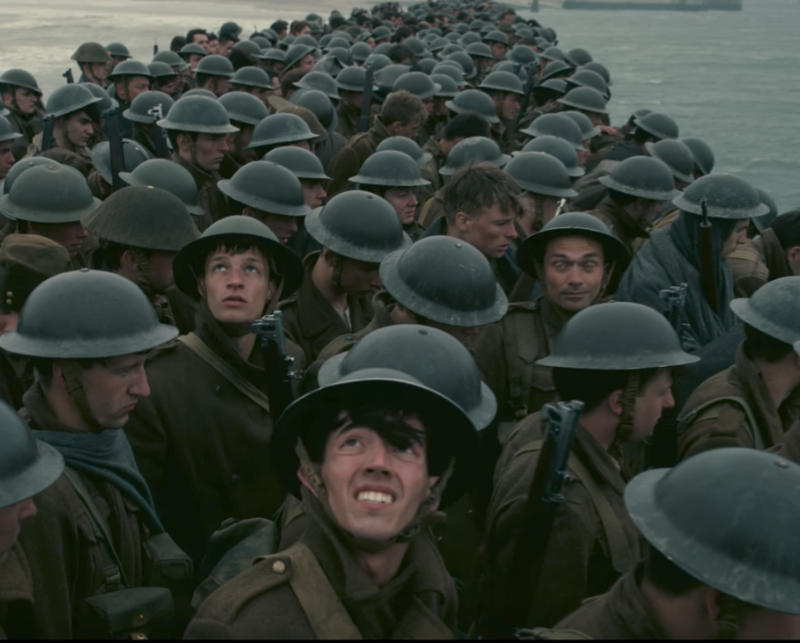 Knowing that Christopher Nolan’s Dunkirk would play town in the wide-gauge format, the dreamer in me hoped the film would screen ahead of time in 70mm. No such luck. This is the only time in my life where you’ll hear me complain about a 2D IMAX press screening. Nolan shot the film in 70mm. Why anyone would want to view it in any other format doesn’t compute, particularly when there’s ample opportunity to see it on film. Dunkirk screens in 70mm at three locations: AMC Mission Valley, AMC La Jolla, and Reading Cinemas Grossmont Center. The screen in the Grossmont 1 is bigger than either AMC location. Their presentation of The Hateful Eight was flawless. Based on screen size and past performance, I’m giving the edge to Grossmont. Roadshow releases were a staple of my cinematic upbringing. Ma dolled me up in a suit and tie for the Sunday afternoon Cinerama presentation of The Wonderful World of the Brothers Grimm, How the West Was Won, and numerous others reserved seat engagements. To ensure seating, tickets for Funny Girl, Oliver, Patton, Fiddler on the Roof, and many others were pushed through a mail slot weeks in advance, not a box office window on the day of the show. As late as 1973 a film such as Last Tango in Paris was still being given the Roadshow treatment when it opened. If you are of a mind to see the picture, I ask that you do so in 70mm. This is one type of behavior that we should all encourage. I'll be there for today’s twilight performance. Updates and observations will appear in the comment section if needed. July 21, 2017 @ 5:08 p.m. Thank heaven I got my "Dunkirk" ticket at the 70 mm La Jolla AMC 12-plex! I appreciate this information. I am previewing it for an 11-year-old boy who is worrisomely fascinated with warfare in all its forms from medieval times to World Wars I and II. (I have not told him about a great-uncle who went to West Point and hated every minute of its plebe-hazing rigid social environment.) Trying to be positive, I tell the kid he can grow up to be a military historian somewhere.